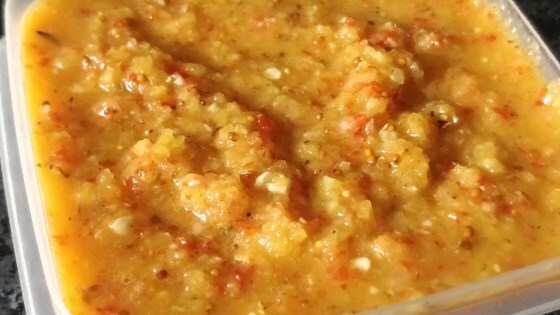 "Trinidadians LOVE their 'peppa' sauce, and this one is full of flavour and heat! Sooooo easy to make -- no cooking, just your blender to create this taste of the islands. Try using different peppers to vary the flavour and heat. Use over meats, in sandwiches and stews. Trinis use it in anything savoury!" Wearing disposable gloves, and being careful not to get any in your eyes or on your skin, roughly chop the habanero peppers. Place the habanero peppers, mango, onion, green onions, and garlic into a blender. Pour in the vinegar, lime juice, and vegetable oil, cover the blender, and pulse until the mixture is very finely chopped. Stop the blender, and add dry mustard powder, salt, curry powder, and lime zest. Blend again until the sauce is smooth. Pour into clean jars, and store in refrigerator. has anyone tried canning this recipe?